Back in 2014, I shared a post about an animated Google Doodle in honor of Maria Gaetana Agnesi's birthday that year.The Doodle appears to represent a curve that bears the odd name "witch of Agnesi." Many books and websites say Maria "invented" the curve, but that's a myth. While Maria does discuss the curve in the mathematics textbook she wrote, the fact is that the curve had already been studied by other mathematicians before her. One of those mathematicians, Guido Grandi, had used the term versiera to describe it. The name "Witch of Agnesi" was invented by Cambridge University mathematics professor John Colson when he translated Maria's math textbook from Italian into English. Colson gave the book it's English title: Analytical Institutions. Unfortunately, when Colson translated Maria's description of the curve, he apparently confused “la versiera” with “l’avversiera,” which means “wife of the devil.” Because of this mistake, Colson named the curve the “Witch of Agnesi” and that's how it's been known ever since. Maria, who was devoutly religious, would be horrified at the name! Celebrating Maria Gaetana Agnesi's 300th Birthday! May 16, 2018 is the 300th birthday of mathematician-turned-humanitarian Maria Gaetana Agnesi. But Milan, Italy, her birthplace, has special events planned in her honor all year long, including a program sponsored by Poleticnico Milano on April 19. If you can read Italian, check out the impressive program here. 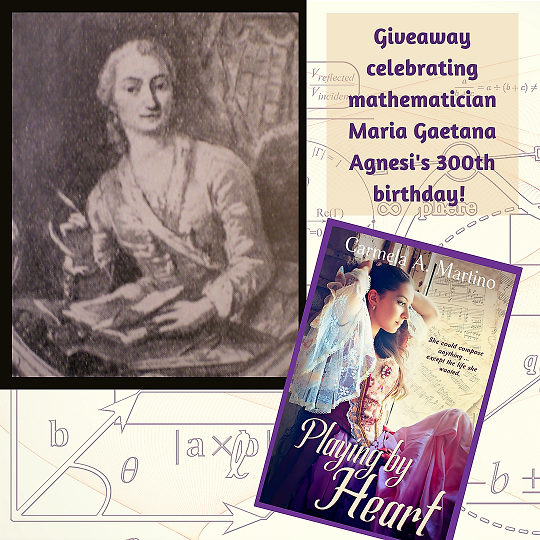 Since my research into Maria Gaetana Agnesi's life led me to write the novel Playing by Heart, inspired by her and her younger sister, Maria Teresa Agnesi, I think it only appropriate to sponsor a giveaway of the novel to celebrate this momentous birthday. See my website for details. I hope that by Maria Gaetana Agnesi's next birthday, I will have found a publisher for the biography I'm working on about her. Meanwhile, happy birthday, Maria! Today, March 8, is International Women's Day. 18th-century sisters who inspired my historical novel Playing by Heart. 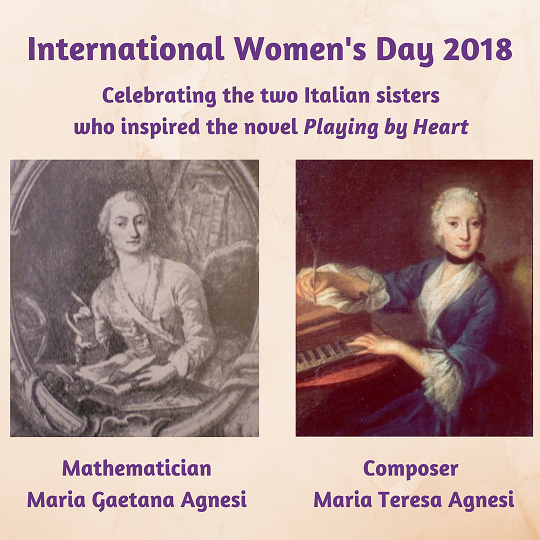 The sisters are linguist, mathematician, and humanitarian Maria Gaetana Agnesi and musician and composer Maria Teresa Agnesi. I started this website back in 2010 to debunk some of the myths surrounding the two sisters, especially those about Maria Gaetana Agnesi. Unfortunately, eight years later, there's still an amazing amount of misinformation about the family that continues to be disseminated both in print and online. One of the most annoying myths, in my opinion, is that the father of the Agnesi sisters was a mathematics professor. I discussed this myth back in June, 2010. I'd been pleased at that time to see that the error had been corrected in the Wikipedia entry about Maria Gaetana. Unfortunately, since then, someone has updated the Wikipedia entry so that it is now wrong again! The best information I’ve found regarding Maria Teresa Agnesi and her music is in Volumes 3 and 4 of Women Composers: Music through the Ages, edited by Sylvia Glickman and Martha Furman Schleifer. 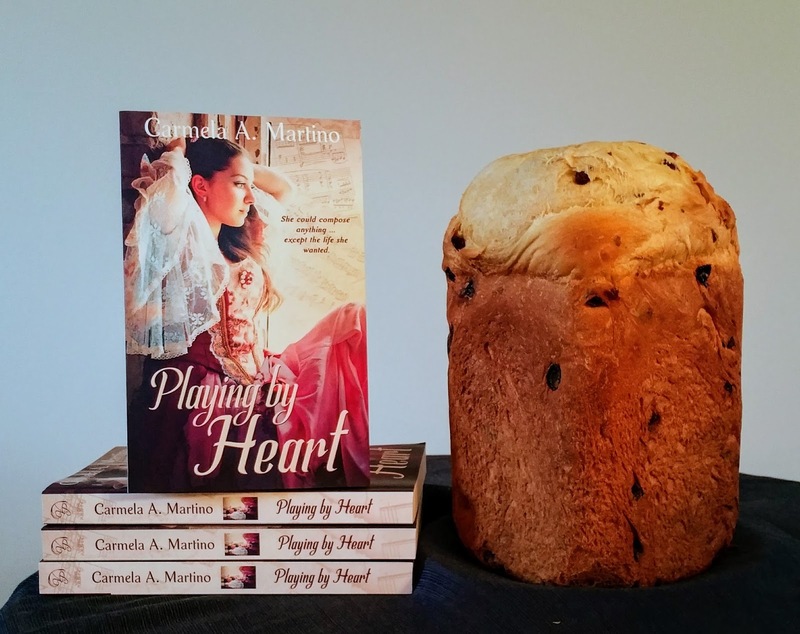 I include these references in the Author's Note of my novel Playing by Heart. As I shared here recently, I'm currently offering a special giveaway in honor of Women's History Month. 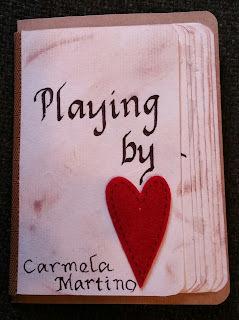 You can read the giveaway details as well as download an excerpt from the novel on this page of my website. Today kicks off Women's History Month. 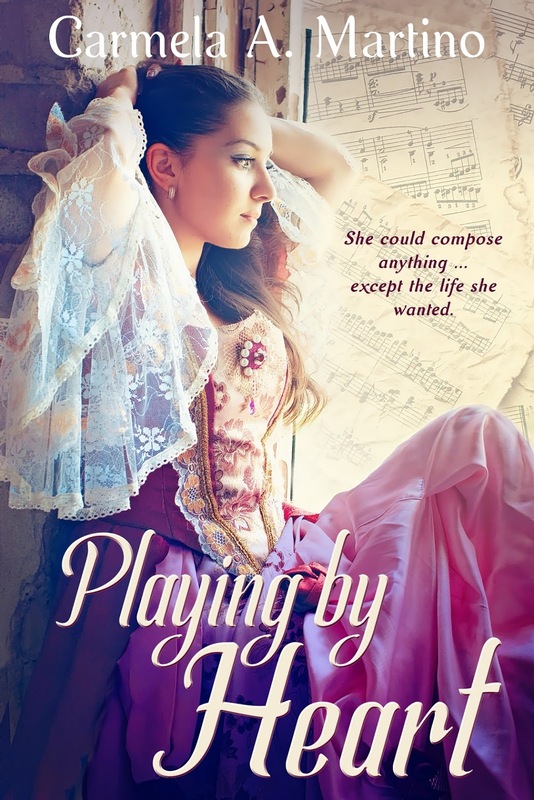 I learned a great deal about women's history while researching Playing by Heart. The novel was inspired by the two eldest Agnesi sisters: accomplished musician and composer Maria Teresa Agnesi and her older sister, linguist, mathematician, and humanitarian Maria Gaetana Agnesi. You can read more about Maria Teresa on her page of this site and about Maria Gaetana on her bio page. The six-month anniversary of the release of Playing by Heart also occurs later this month. It's hard to believe the book has already been out almost six months! 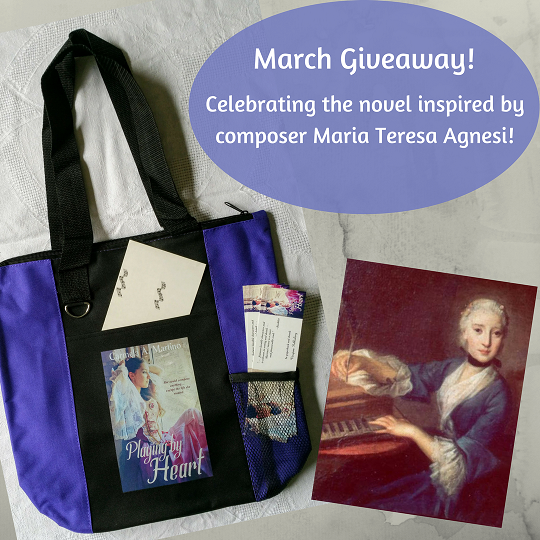 To celebrate, I'm hosting a special "Book Bag & Swag" giveaway on my website. You can find all the details here.